Everyone knows that first impressions are important. Within moments of meeting someone we leave an impression – good or bad. It is the same principle with your space, the front entry or foyer is the first place your guests experience. Although we don’t usually spend more than a few minutes in the foyer, this space is still important! It’s the perfect place to express your style and create a welcoming transition space from the public areas to your private home. Yes, we love light… we can’t emphasize enough how important it is! After all, what use is a good design if you can’t see it? Your front entry needs to be well lit. Ever had the challenge of digging through your bag or a drawer for your keys? You know the importance of good lighting! There are many options to light up your front entry depending on how big it is. If your foyer is large with high ceilings, definitely consider having a chandelier. It becomes not only a source of light but a focal piece that can be quite stunning. Got a smaller front entry? A couple of wall sconces will provide plenty of lighting without taking up space. If you have the space for an entry table, a beautiful lamp will also do the trick! Not matter how small or large your foyer is, you need seating and storage. Coming through the door, you are bound to have keys, a bag or two to put down. Wouldn’t it be nice to have somewhere to put them all down right away without creating a mess on the floor? An entry table or a shelf is the perfect spot to put down your keys and some mail. Make room for a chair or if you have the space, a bench works double duty as a place to take off and put on your shoes with space to put down your bags and storage below. Of course, a place to store coats is important. If you don’t have an entry closet, install a few hooks or a coat rack to put your wet coats after coming in from the Vancouver rain. Gloves, umbrellas and other accessories need a home as well, so make sure to provide storage for those items as well! If you are unsure of trying something bold anywhere else in your space, the front entry is the best spot to try! It’s not a huge space and you only spend so much time there a day so why not try something bold. If you have never had wallpaper, this is a good opportunity to find one that you love. Mirrors are always a must as they are not only functional but also makes your space feel bigger and brighter. Hang one above your entry table with wall sconces on either side for a tried-and-true pairing. Of course, accessorize your entry table with a vase of fresh flowers (or faux for easy maintenance) and other décor in your style. To add more character to your front entry, a nice rug pulls the space together. If you have a great piece of art (or a few), the foyer is a wonderful place for display. Refer back to one of our previous blogs “All You Need Is Art” for tips and inspiration. No matter what your style is, there is an opportunity to make a statement in your foyer! With e-books and e-readers escalating in popularity, books and libraries tend to be forgotten and are thought of as a thing of the past. Remember being a child and devouring endless amounts of books on a day-to-day basis? Some of us have collected vast amounts of books over the years, which now sit in cardboard boxes in the garage. What a shame! No matter what size space you have, books can add character. From a stack of coffee table books to a home library, there are plenty of ways to get inspired by books all over again. Below are some of our favorite ways to create a space inspired by books. Coffee table looking a little bare? We love keeping a few books stacked up on a coffee table or side table in the living room. Find a few great books with interesting covers or catchy titles (these can be great conversation starters). Pile them up and place a stack on the floor next to a floor lamp and vase to create a vignette. This adds visual interest. 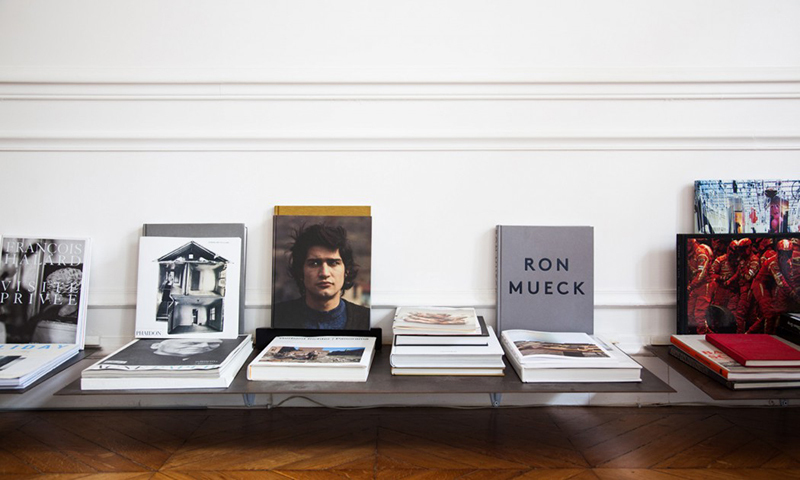 I truly believe every home needs art and books; these are two things that give your home a personality. Isn’t it fun to see what someone is currently reading? Fiction, non-fiction, college text books? What are you currently reading? Are you more of an avid reader but don’t have a big enough of a collection to fill a bookshelf? That’s okay! Display your books along with some decorative accessories and family photos on a shelf, console or nightstand. Bookshelves don’t have to be boring like the endless ones at the library. We are loving Crate & Barrel’s Leaning Wall Shelf and West Elm’s Lacquer Storage Bookshelf. Also check out IKEA for a variety of options. From tall linear bookshelves to ones that have a mix of rectangular compartments, there is no shortage of interesting bookshelves on the market to suit your style and budget. Get one without a back and use it as a room divider! Fill it with your favorite books, some decorative pieces, framed photographs and perhaps some items you have collected over the years. Locally we have some restaurants and shops that have used books to add character to a space. Since it is still summer and patio season, go check out Tap & Barrel in Olympic Village. Before you go out to the second floor patio for a couple drinks, check out the “The Library,” the 12-seat private dining area tucked in the back. If you are downtown and in the Waterfront area, Tap & Barrel has another location which also has a library area that is worth taking a gander at. Then why not head over to Gastown? There are many stores with great products and interiors to inspire. Worthy of a visit is LYNNsteven, a women’s clothing boutique designed by local talent Michael Green Architecture. Here you will find a unique cylindrical partition built from books that MGA bought off of Craigslist. From afar the cylindrical form at LYNNsteven looks like it is made of bricks. A unique, functional and very intriguing focal piece, the design won the 2010 IIDA Project of the Year Award. Get out and get inspired! Do you have a space that is a little ho-hum and could use a little character? Perhaps your walls are bare because you have no idea what to put up. Or do you have the opposite dilemma with far too many photographs, paintings etc. that you are not sure what to keep up and what to take down? Fear not, finding the perfect balance between bare and busy can be found! We have gathered some of our tips and tricks to create your own art inspired space. You don’t need to be an art collector to have an art inspired space. Just a couple good prints can do the trick! A large over sized painting or photograph centered on a wall creates a focal piece that is hard to miss. If you have a series of prints or photographs, line them up and space them out equally and you will have a mini gallery! Just add some lighting and your prints on a budget can look like treasures only found from art dealers. If your space is smaller and less formal, don’t even bother with hanging up your art pieces. Line them up along a shelf or even place on the floor or console and prop against the wall. You can create a vignette this way by layering your art with some sculptures, accessories and books. Voila, you have created your own masterpiece. If your art is bold and loud, keep your furniture neutral in color and pick up some of the same color in toss cushions to pull the room together. The same way a hairstyle frames a face, a frame on a photograph, print or painting can make a huge difference. A thick fame makes a bold statement whereas a thinner gallery frame barely intrudes on the image allowing the art to speak for itself. Color is also an important aspect to consider. Black and white frames keep it nice and simple. While metals such as silver add a bit more glitz and glamour or even traditional appeal. For a more eclectic look mix and match frame thicknesses and colors (this one can be a bit tricky for a first timer, be careful as it can also look like a mess. I suggest you find an inspiration photo to follow for this look). Looking for frames on a budget? Check out IKEA, or for a more professional look try the gallery collection from Pottery Barn. If you have artwork that doesn’t fit in these pre-fab frames then head down to Opus or Michaels and custom frame your pieces. Keep your spacing between pieces consistent. We often suggest you lay the arrangement out on the floor and make sure you like it before you put the first nail in the wall! Once you have determined your layout now you need to find the center of your wall and start with your center image and work your way out. I suggest mounting your first image around 5’-0 above the finished floor the center of the art pieces. If all your frames are the same size you will most likely be creating a cleaner, more modern arrangement. Such as stacking a grouping of say 4 or creating a horizontal line. In which case the bottom and top of all your frames should be aligned. If you have opted for various size frames you may decide to try hanging them at various heights. This look is harder to achieve as it really depends on the amount and sizes of your art pieces. 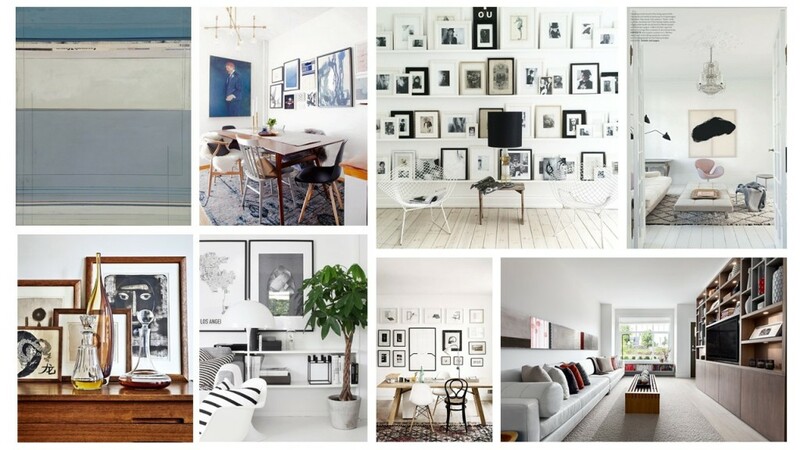 I would suggest you have a minimum of 10-12 to start your gallery wall and be sure to pre-determine your layout. Looking for a great piece of art? On a budget? Head over to art.com or allposters.com although I warn you…you may lose hours of your life. Etsy and Society are also worth a look. If you are ready to invest in an original piece we have lots of great local talent right in our own backyard. Some of our favorites include Jill Pilon, Studio N2 and Carla Tak just to name a few. Although only once a year a fun way to source up and coming artist is by visiting their studios during the Eastside Culture Crawl. Soaring double height ceilings, brick walls, reclaimed wood, concrete floors and windows that span an entire wall to frame the amazing view. Haven’t we all dreamt of this? You are sure to have seen images of this look everywhere lately. 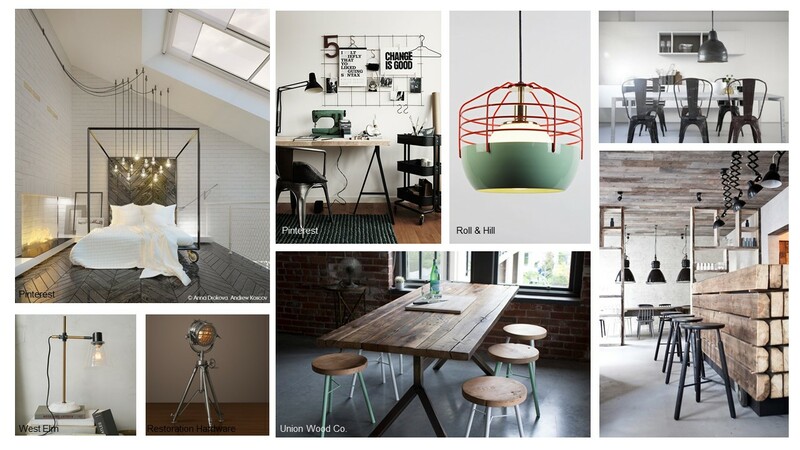 Just open a magazine or head on over to Pinterest… Since we all can’t live in Gastown or the Armoury District, just continue reading below for some tips on how to bring this industrial look home. Finishes are everything when it comes to an industrial inspired space. Usually the first things that come to mind are concrete floors and brick walls. Concrete floors may not be possible, but that brick wall look can be achieved with the help of some new innovations in wall coverings such as this faux brick. They look just like the real thing! Another key ingredient to the industrial look is when the finish has been distressed or has a patina. You don’t have to look far to find a flood of concrete, or reclaimed wood furniture and accessory pieces. Check out some local favorites like Old Faithful, Crate & Barrel, Style Garage and Restoration Hardware are sure to help you achieve this look. Be careful not to overdo it! Balance it out with some white walls or other white finishes; read our previous blog “Why I Love White” for more. Of course, we can’t forget about the metals. Take your pick from the ever popular steel, copper or coated black. Don’t go with anything too shiny though (leave the glam behind), we want some patina for that unfinished, old and worn look! We’ve mentioned it before, and we’ll say it again – lighting sets the mood! If you don’t have huge windows to let in lots of natural light, your choices in lighting are even more important. Those old Edison light bulbs are back in a big way and can be found absolutely everywhere! Hang just one as a pendant over a side table or cluster of them at various heights over your dining space to create a focal point that is sure to wow. There are also some great vintage looking dining pendants and desk lamps that enhance the industrial aesthetic. Have you seen the Roll & Hill, Bluff City traditional pendant shade and wire cage pendant that provides a postmodern feel? How about the old warehouse pendant in a porcelain enamel finish from Old Faithful? 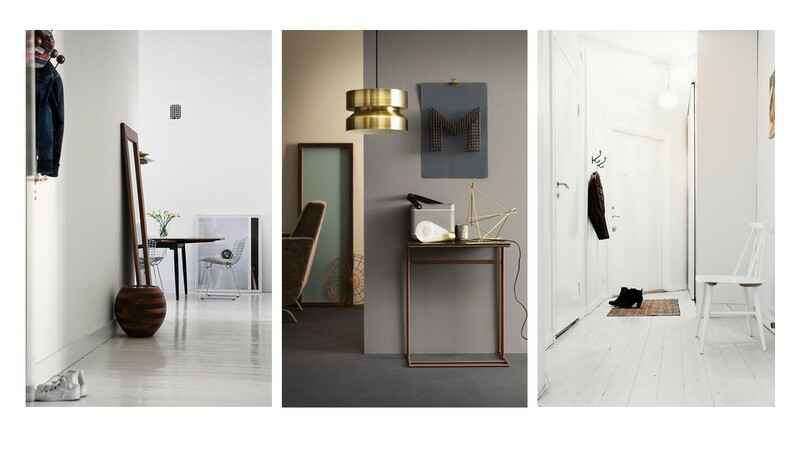 These are only a few examples of how to let the lighting enhance your mood and style. One of the best things about the industrial look is that worn and old furniture is perfect. No need to go out and spend thousands of dollars on pristine new pieces! Try using a mix of metal, concrete and reclaimed wood for your key furniture pieces. Locally we have J & S Reclaimed Wood who provide ready-made and custom pieces from salvaged wood from old barns (even old pipes get a new life as legs and gables). Union Wood Co. is another popular source for the reclaimed and salvaged millwork and furniture. Just one key piece of their furniture is sure to add character to your space. Metals – ever considered a rolling stainless steel cart as your dining table? Try the one from Design Within Reach (many of us want it for ourselves here at A3)! Crate & Barrel offers a metal base and concrete top dining table. Restoration Hardware excels in this look, from the vintage dining stool to their concrete outdoor fire pits. No matter what your budget and timeline is, there is no shortage of industrial inspired products out there. Old is new!